Tuesday: We got the materials and work really picked up on the system. The installation team led by Dale Bain and Harold Barnett punched holes in cinder block walls and solved one challenge after another. It’s not like you can run down to Home Depot for more parts. You must use your supplies wisely! And we brought ours from Kansas. Our in-country interpreter Mario is a true partner of Agua Viva, he enabled our Guatemalan partners to help build their water system. This is a key objective so that they have ownership in the water system and can maintain it and make repairs once we leave. The intent is this water system will last many years to come. 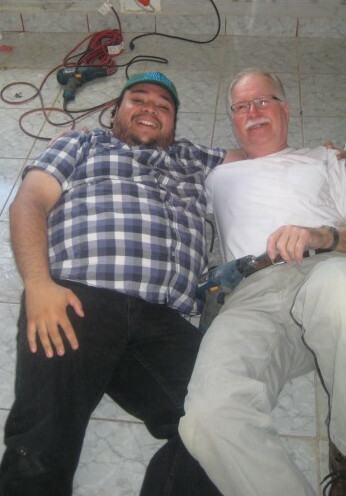 Mario and Harold laying down on the job! However, this was day two for the education team of Andrew Ferdon and Jared Orr with their interpreter Stephanie. It quickly became clear that we were also leading a gender empowerment movement. 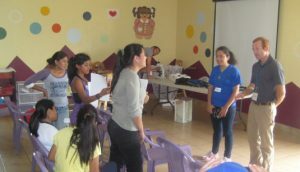 Because of our train the trainer model, we ended up training the older girls who were now living in a shared apartment in the small town of Monjas. Imagine, you are too old for the orphanage, at some point you move out and start to transition to independence. Seventeen girls living in a large apartment home. We visited them one evening and played board games, No American kids keep their rooms as clean as these girls and they were all under 20. The pressure of being a teenager and the clock is ticking is a reality for these girls and nobody is going to baby them as they have to grow up fast. These were the water education students and they would become the instructors and leaders to teacher proper hygiene and how to use clean water. Water is a great gift and they learned how to best use it just as living water. Turns out that 85% of the kids at “Shadow” are girls. Like many societies women don’t enjoy the same opportunities as men, and girls are the most at risk of being sold at a young age. Yes, SOLD is an accurate word to use. With no birth control, extreme poverty, and desperation, prostitution is often a reality for many girls. As a result the orphanage has been focused from day one on rescuing and housing girls, but they do have one house of boys. Wednesday: These teenage girls were being trained on how to use clean parasite free water and to teach others the importance of clean water, hygiene and how to improve everyone’s health by just drinking clean water. Clean water was something that the vast majority of people in the community did not have access to. This was also true for the children (could be part of the reason most are under 5’ tall). Seven teenage girls were the morning focus for our education team. The girls learned from a Mechanical Engineer and a Structural engineer who were as playful as kids themselves. Their 22 year old Guatemalan translator, Stephanie, who is college educated was a perfect role model for them. They learned, used a microscope, and performed experiments that convicted them on how important clean water that is free of parasites is for their bodies. These young women will train their former high school teachers, the house parents and the staff at the Shadow project, all while seeking to find meaningful work and furthering their own education. They will also deliver the message in-town where they can supply their neighbors with the same access to clean water.